An estimated eight million tons of plastics enter our oceans each year, yet only one percent can be seen floating at the surface. This is the first in a three-part article series about how researchers at Woods Hole Oceanographic Institution are trying to understand the fate of “hidden” microplastics and their impacts on marine life and human health. When we think of plastic in the ocean, we often think of easily seen things such as water bottles and plastic bags. In reality, the vast majority of plastics in the ocean are smaller than a millimeter and can’t be seen with an unaided eye; some particles resemble bird seed, others look like dust. These small fragments are known as microplastics. 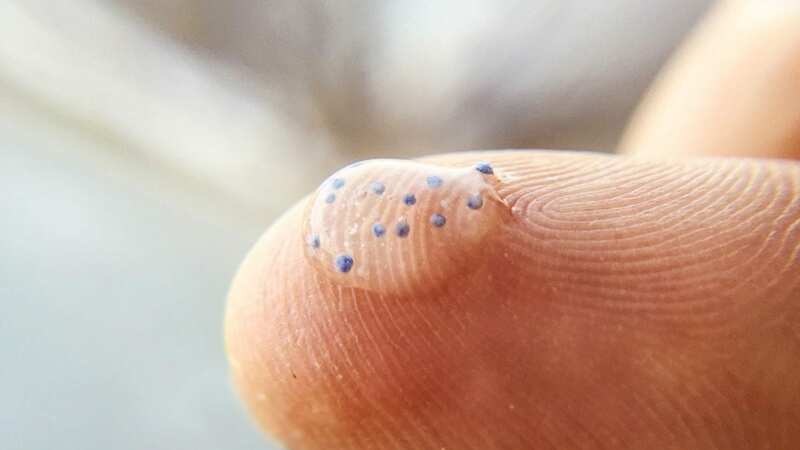 Some are “micro” by design: Microbeads, for example, are tiny plastic spheres manufacturers add to body washes, toothpastes and other products to give them extra scrubbing power. Lentil-sized pellets known as nurdles are ubiquitous fodder used in the manufacture of many common plastic products, are also intentionally small. Other microplastics become “micro” over time when larger pieces of plastic debris, such as water bottles, straws, cups, and car fenders, are exposed to forces of nature that cause them to degrade. Sunlight, for example, oxidizes plastic and causes it to weather and degrade. Freeze-thaw cycles can weaken the structure of plastics over time. And ocean waves could also be taking a toll, making plastics more brittle by constantly washing over them and grinding them into sand. Scientists have a decent sense for the types of physical and chemical weathering processes that can cause plastics to break down. 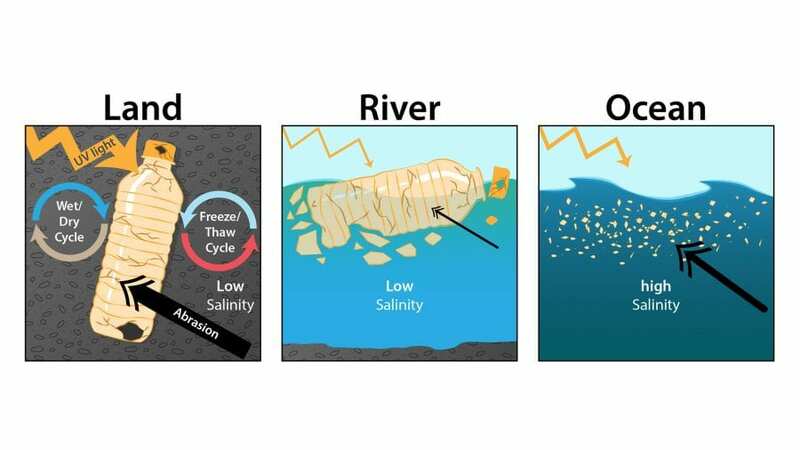 However, little is known about how quickly degradation happens, and whether most of it is happening on land, in rivers, or in the ocean. It’s unclear, for example, what happens to a plastic water bottle between the time someone takes his or her last swig and when the empty bottle ends up in the ocean, said WHOI senior scientist Chris Reddy. Another big unknown is the impact marine microbes have on the breakdown of plastics in the ocean. Studies have demonstrated that microbes cling to even tiny plastic fragments, and nibble at them as well. But whether they are causing any significant breakdown of the material is something that scientists at WHOI are just starting to investigate. The uncertainty surrounding where and how quickly plastics break down has become a critical knowledge gap not only for scientists, but also for chemical companies and plastic manufacturers that want to design plastics that decompose faster into materials that are non-harmful and have minimal effects on the environment. One way to gauge the speed of degradation is by placing plastics—including “raw” plastics containing no additives, as well as consumer products such as Styrofoam cups—in specialized weathering chambers. Scientists can conduct experiments in these chambers that test how factors such as sunlight, temperature, and humidity contribute to physical breakdown processes. “These chambers provide a realistic picture of what happens on land and in the ocean,” Reddy said. 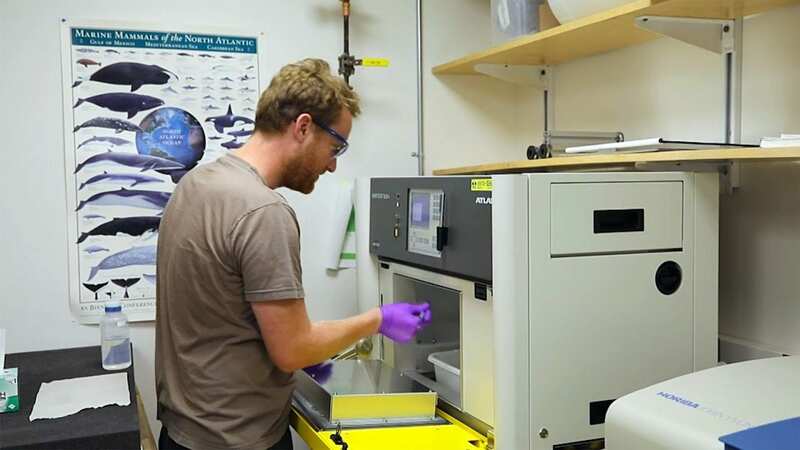 Collin Ward, a marine chemist at WHOI, says one of the main advantages of the weathering chamber is speed: It can accelerate the weathering process to answer environmentally relevant questions faster. When testing the effects of sunlight, for example, the chamber’s light source can be cranked up to flood plastics with ultraviolet light that is ten times more intense than natural sunlight. Weathering chambers will help, but Ward says that gaining a true sense for how plastics breakdown will be far more complex than simply blasting them with sunlight in a box. This is due to the fact that there are so many different types of plastics, and each type may break down at different rates in the environment due to the base polymers used and the types of additives and pigments applied to the materials during the manufacturing process. For more information about WHOI’s Marine Microplastics Initiative, visit microplastics.whoi.edu. From Macroplastic to Microplastic An estimated eight million tons of plastics enter our oceans each year, yet only one percent can be seen floating at the surface. Researchers at Woods Hole Oceanographic Institution are trying to understand the fate of “hidden” microplastics and their impacts on marine life and human health.